Back to Diag.1, sente's formation is called Boat Castle (Funagakoi in Japanese). It's very simple. Kakoi or Gakoi means castle in Japanese. Sente is aiming to bring out the left silver and open fire rapidly from the point 3e. This strategy is called Left Silver-5g Rapid Attack, which is very different from Anaguma in that Anaguma tends to be a slow battle. Edge pawn on 9th file is mostly pushed by each opponent in this strategy because gote wants to make room for the king to escape when attacked from the side in the endgame, and sente wants to have the possibility of edge attack and sometimes move his bishop to 9g for attack. 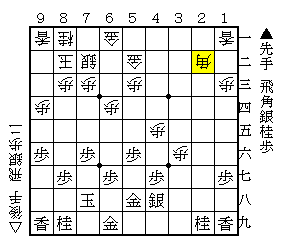 To be more specific, I'd like to explain about the rapid attack strategy called Yamada Joseki from here, and will write about Anaguma later. 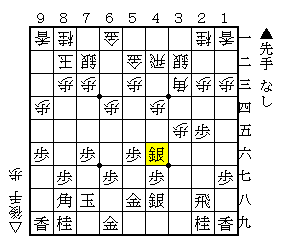 Yamada Joseki is one of the basic joseki against 4th-file rook invented by 9-dan Yamada (1933-1970). When gote pushes P-6d in Diag.4, sente begins to attack with P-3e. 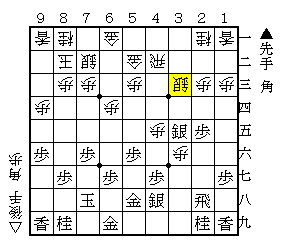 This move is the characteristic of Yamada Joseki. 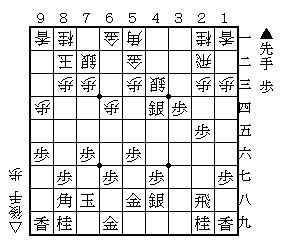 Sente is aiming to break the 2nd file with the rook and the silver, and it's difficult for gote to defend the 2nd file completely. For instance, in reply to S-4f, if it proceeds with S-4c, Sx3e, R-2b for protecting the 2nd file, sente would be better with P*3d, B-5a, Sx4d (Diag.6). In 4th-file rook games, basically, gote should not allow the silver to advance on 3e remaining his rook and bishop in his camp, because the major pieces would be oppressed by sente. Thus, gote needs to prepare for a counter attack in return. 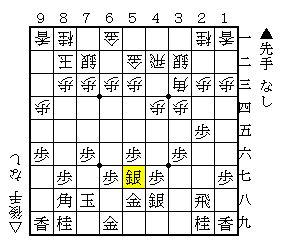 Here, (1) P-3f is the mainstream of this joseki, and (2) P-4e is also considered as an option. P-3f is a common move to deal with the left silver rapid attack. And after the bishop exchange, it seems possible for sente to break the 2nd file with P-2d immediately. However, now is not the time to push the pawn, because gote has a counter attack. In this situation, gote would be slightly better. B*3c, Rx2a+, R-2b was the line that gote prepared in advance. Instead of R-2b, promoting the bishop with Bx9i+ is defended by S*8h, and the horse will not work well. At Diag.8, you may think sente is rather better because it gained a knight. But, sente has to stop the bishop's diagonal by using hand pieces, and gote will take the knight back with R-2h immediately. In addition, gote's castle is stronger than sente's. For these reasons, gote has a little advantage here. In 4th-file ranging rook vs. Rapid attack games, Mino Castle would be stronger than Boat Castle in many cases when both players go for mutual attack. Therefore, the side executing the rapid attack should aim to oppress the opponent's attacking position first. Back to Diag.7, P-2d was not good. 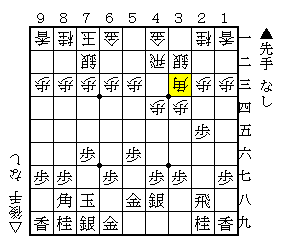 According to Yamada Joseki, B-7g or B-8h is better. The meaning of this move is to secure the bishop's diagonal beforehand.